Teklynx LABELVIEW™ Bar Code Labeling and Integration Software - Perfectly Simple. LabelView's newest edition (rewritten using 32 bit C++ ) is now ready for Windows NT. Shipping with the 32 bit version is our new and improved 16 bit version which contains almost every new 32 bit feature--with the exception of "longer file names". New interface design loaded with plenty of ease-of-use features. Resize and edit a group of objects. LabelView can export any label design screen to Visual Basic with one click of the mouse. Incrementing, Serial and Lot Numbering: Automatically increment/decrement any field. 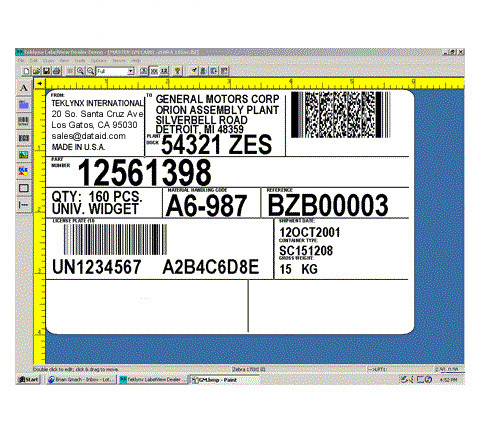 Create, increment and control simple or complex alpha numeric serial numbers for every label. Remembers last number used for each product or carton serial number which meets ISO and QS-9000 standards. [Incrementing, serial and lot numbering] Create and control accumulators to track items or production. Automatically calculate and print total units per case, labels per day, etc. Import, edit and print paragraphs - in any font. Date and Time: Select from dozens of date and time formats. LabelView can calculate and print expiration or sell-by date. You can even identify your accounting or fiscal calendar dates to correctly print production week. Of course, Labelview was designed from the beginning to be fully compliant. Picklist: Instantly create and use simple drop-down lists. Make label printing even faster and reduce data entry errors. Paragraphs: Import, edit and print paragraphs -in any font. Let LabelView automatically select the right paragraph from your database. Great for ingredients, product instructions and more. Media Management: Media Magician:™ (Optional module) Automatically monitors and tracks all media (labels) and ribbon usage, waste, receipts, lead times, safety stock and [Built in relational data base editor] trends. Calculates required re-orders. Sends order via fax or internet (email) every week automatically. Open any Data Base Connectivity Label Inventory: (Standard module) Tracks label usage and re-order points. Link LabelView Pro offers powerful linked fields to add logic, control and flexibility: use formulas, functions, math or calculations to manipulate, create or update fields for accuracy. Link fields or portion of fields with others to create complex numbers, bar codes or formulas. Integrated Database: Built in relational database editor makes it easy to create and edit data files; or use almost any windows compatible database program. ODBC: Allows use of any Open Data Base Connectivity (ODBC) object. Use data from database applications such as EXCEL, Microsoft Access, Foxpro, Visual Basic or from UNIX or AS/400 host systems. 2D Bar Codes: 2D bar codes are becoming more important, yet only LabelView can print them on ANY printer, even if 2-D symbologies. are not supported by the printer. Plus, use automatic linking to create a multi-item bar code from your database for 2D bar codes. Security Password Control: Assign a password to determine who may change a specific label. Create a list of valid users with varying rights to print or modify labels, change data. Useful in keeping pre-production labels from being used prematurely.